In many organisations it is a real challenge to produce Enterprise Architecture that delivers strategic value to the business. Historically EA has been centred on the IT domain, but to reach its true potential, EA must support the entire business. EA should play a crucial role when it comes to developing new or changing strategies, company acquisitions and mergers, business transformation or perhaps introducing new product lines. If Enterprise Architecture is to become a genuine 'business tool', it must be designed in such a way as to enable the business community to easily understand it and to encourage its use. it needs to be able to communicate to the 'business world'. it needs to be easy to use and easy to understand. it needs to be able to capture the complexities of the organisation, across the strategy, operations, processes and technology, and yet to be able to communicate their interaction and alignment in a simple and effective way. and it needs to provides effective business analysis. QPR EnterpriseArchitect provides all the functions you would expect to find in a best of class EA tool. 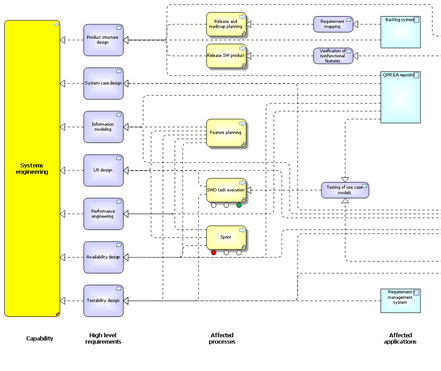 It supports modelling standards such as TOGAF®, ArchiMate® , Zachman, UML, IDEF, BPMN etc. but as importantly, it is packaged in a way that makes it as easy to use as Microsoft Office®. 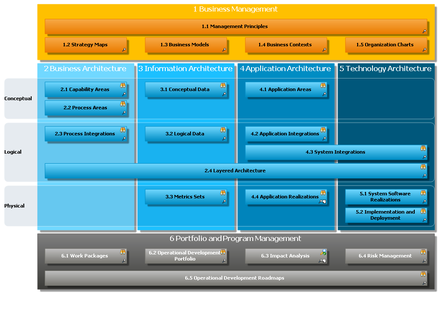 But what really makes QPR EnterpriseArchitect different, is its integration with Performance Management. Having the ability to link your capabilities, requirements, goals and processes, etc. to traffic lights and KPIs allows you to elevate EA out of the IT domain and into the board room. Having the ability to raise and assign action plans, to create project packs showing say just those processes with red lights, enables you to offer a comprehensive management and governance capability. With QPR EnterpriseArchitect, architects have a single design environment that encompasses their organisation's enterprise and business architecture, including strategy, operations, processes and technologies. It has a completely open meta model, which provides architects with total flexibility, as well as comprehensive catalogue, diagram and matrix modelling capabilities. The system is designed for rapid modelling. The tool palette is context sensitive, therefore offering the architect only those elements etc. that are approved for that particular area. QPR EnterpriseArchitect has been recognised within Gartner's 2014 EA Magic Quadrant. QPR has also been given a Positive rating in Gartner's MarketScope for Enterprise Business Process Analysis (Nov 13), no other vendor scored higher. For more information on QPR EnterpriseArchitect, please visit our papers / fact sheets download page.